My first video is now available on my brand-spankin’ new YouTube channel. Drop what you’re doing and check it out. Or not. It’s my first video in a rather long time, so it may not be all that great. In this video, I show how to find duplicates. As I switched from 20+ years on Apple Mac computers, I decided to make the switch to Windows 10. I’ll explain more in future posts. Part of the reason was that Apple no longer supports Apple Aperture. In the meantime, it was a big effort to make the move. How big? Big. I had many terabytes of data to move from my iMac to my new Lenovo. Of that, I had 248,356 in my Apple Aperture photos. When I switched originally from iPhoto to Aperture, I knew that Apple had created a lot of thumbnails. I tried to clean them manually, but it was just to tedious and time consuming. So I figured making the switch from Apple to Windows 10 would give me a rare opportunity to reorganize and remove duplicates. What’s more, this didn’t even include the photos that I didn’t import into Aperture. This was about 75% of all of my photos, not even including my photo reference files. Lots and lots. And lots of duplicates. I’ll begin importing all of these files into Adobe Lightroom soon. Stay tuned for video demonstrations of this process. If you’re a photographer, you’ll probably find this stuff useful and interesting. The rest of you, not so much. In this video, I show how I used Duplicate Photo Cleaner. I read the reviews, downloaded the demo version, and decided that it would work for my needs. After that, I paid for the upgraded version and gave it a whirl. 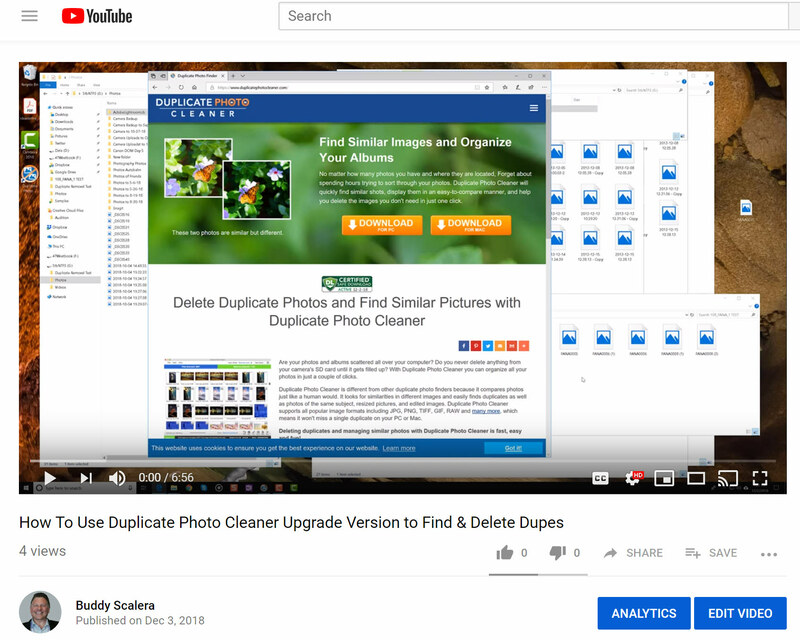 The video demonstrates how to use Duplicate Photo Cleaner to scan folders and delete duplicates and thumbnails. It’s a quick video that I recorded using Camtasia Recorder by Techsmith. I edited the video using Techsmith Camtasia 2018. Don’t blame them for my lame edits. That’s all my handiwork. As I mentioned, this is the first video on my new YouTube channel. Here’s my original YouTube channel, which has a few additional videos. I haven’t figured out yet if I can migrate those videos to the new channel. We’ll see. This entry was posted in How To, photography, Software, Uncategorized, video, YouTube and tagged Camtasia, photography, video by Buddy_Scalera. Bookmark the permalink.